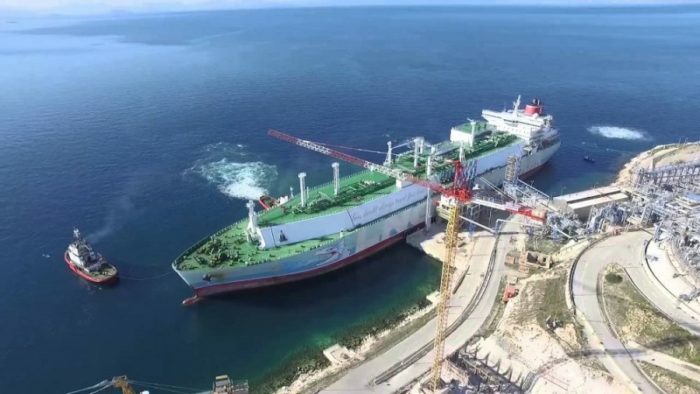 Greece officially opened the third tank for Liquefied Natural Gas (LNG) on the small island of Revithousa, off of the coast of Athens, on Thursday. George Stathakis, Greek Environment, and Energy Minister spoke at the opening ceremony for the project, saying it was creating new opportunities in the natural gas market. Presenting the government’s policy on natural gas, Stathakis said it was focusing on preserving and expanding networks under state control in 18 regional cities. It also aims to strengthen connections to the Balkans with projects such as the IGB pipeline and a plan to interconnect with FYROM, transforming Greece into a hub for natural gas. He added that the Hellenic Natural Gas Operating System (DESFA), is playing a strategic role in this policy. The Revithousa LNG terminal is one of thirteen operating in Europe, and the only one in the Balkans. With the addition of its third tank, the terminal’s capacity has risen from 130,000 to 225,000 cubic meters, with a flow of 1,000 — 1,400 cubic meters per hour. The project also included an upgrade to port installations, allowing the docking of larger ships of up to 260,000 in deadweight tonnage. The budget for the project totaled €143 million ($163.5 million), consisting of 35 percent funds from the European Union, €80 million ($91.5 million) in loans from the European Investment Bank, and DESFA’s own capital.